NOTE: If you do not see the contest rules and information you are looking for here, please check the individual department section. If you still do not see the information, please contact the Director or Committee. Time Limit: 6 minutes. STATE RUN-OFFS will be held at Cheshire Grange Hall, 44 Wallingford Road, Cheshire, as part of Grange Sunday. There will be no Pomona judging. All entries will go directly to the State Judging. Performance time allowed is six minutes. State winners will be eligible to perform at Lecturers’ Conference and at National Session. For more information, follow this link to the TALENT CONTEST page. "A Number" Contest - Theme: "Holidays"
This can be on any recognized holiday. Any number suitable for a Grange Meeting is eligible. Time Limit: 6 minutes (includes set-up and performance). All entries will go directly to State for judging. Judging will be part of Grange Sunday. Numbers will be judged on presentation, quality, audience appeal, appropriateness of theme, and originality. Complete Program - "It Happened in the USA"
This program must be presented at your own Grange. Full program must be sent to the State Lecturer by October 1st to be considered. All materials used must be included. While we urge you to present your program at another Grange, it is not required. Length 30 – 45 minutes. This contest is open to all Grangers. Best in Show picture will go to National Grange for Judging. Please Note: Grangers in Action should be pictures of Grangers doing something, not posed shots. 1. Only prints accepted. No slides in any category. 2. Participants may enter all categories but are limited to one entry in each category. 4. A rigid backing is required for all photographs. No glass or frame is allowed. 5. Print may be processed commercially, but it must have been taken by the entrant. Remember, this is a picture you took, not a picture of you. 6. Size of backing: No smaller than 4” x 6” or larger than 11” x 14”. 7. Name, Category, Grange and Number must be placed on the back of picture. 8. Judging: Photos will be judged at Cheshire Grange Hall on Sat. June 8, 2019, and Sat. June 13, 2020. Entries may be mailed or given to the State Lecturer ahead of time, or brought to Cheshire Grange Hall between 10:00 and 11:00 a.m. the day of the judging. Write to a service man or woman serving overseas in harms’ way. Let’s let our troops know that we care. These can be sent to someone from your area, you can get addresses at www.anysoldier.com, you can bring them to the State Office or get them to me. Letters must be done in the name of your Grange. Packages should also include a letter. Essay Writing Contest: "My Grange"
Write an essay. It should be 150 words or less entitled "My Grange." Deadline for entries is October 1st. Nominee: Name, Address, Phone, Email. Nominated by: Grange Name & No., Contact Person, Phone, Email. 1. Please describe the industry and position the candidate is involved in. 2. Please describe the difference they have made in their industry, community and/or Grange. 3. What are the candidate's goals, including any furthering of education? A nominee for the Outstanding Agricultural Professional Award should be an individual that has demonstrated excellence in their career. They must be a Grange member and can be in any industry as long as they demonstrate leadership and professional skills that the Grange stresses. Nominations should include the following information or forms may be obtained by contacting the Director or the State Secretary. 3. What are the candidate's goals? Quarterly we will acknowledge all Granges that have taken in new members and especially those who have posted a net gain in membership. 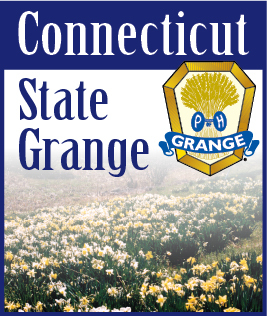 Annually the Granges with the most new members and largest net gain in membership will receive acknowledgement during the Annual Session of the Connecticut State Grange. Additional programs will be unveiled as they become available. Prizes for the needlework contest at the State level will be: 1st Place - $15.00; 2nd Place - $10.00; 3rd Place - $5.00. Prizes for the craft and baking contests at the State level will be: 1st Place - $10.00; 2nd Place - $5.00; 3rd Place - $3.00. State ribbons will be given in all contests. Time and Place for Judging for the State CWA / Family Activities Contests will be announced. Sponsored by the Trustees of the New England Grange Building. Open to the public, no product requirement. There are 11 classes for competition - Afghans, doilies, embroidery, 3 piece baby set, plastic canvas, counted cross stitch, adult garment, quilted wall hanging, stuffed toy, and baby blanket. ALL items submitted for judging must be clean and odor free. Judging at Pomona and State levels only. Subordinate judging not required. All first place State winners will compete at the Northeast finals at the Big E.
Brochures and entry forms for the Northeast Needlework contest may be obtained from the State CWA, Pomona or Subordinate Chairman. Create a basket using any material. Judging will be on workmanship and crativity. Judging is at State level only. This contest is for Connecticut only and will not go on to Northeast Judging. Baskets will be returned . Create a decoration to hang on a door using any material. Judging will be on workmanship. Judging is at State level only. This contest is for Connecticut only and will not go on to Northeast Judging. The Craft Contest is “Down on the Farm”. You may make any item, in any medium that has anything to do with something found on a farm. Judging is at State level only. There are 2 categories: Needlework and Other medium. There will be Adult and Youth classes in each category. Craft entries are not returned (no exceptions). They are retained by the State CWA/Family Activities Committee to be distributed at their discretion. The Craft Contest is “Pirates and Treasure”. You may make any item, in any medium that relates to Pirates and/or treasure. Judging is at State level only. Open to Grange members, children and grand children of members and Junior Grange members. The contest is for Old Fashioned Oatmeal Cookies. Submit 7 on a plate. Put your name and Grange on the back of the plate. Judging for the baking contest is held in the Subordinate Grange with the winners baking again for the State Judging. The contest is for Cross Bones Cookies. NEEDLEWORK CONTEST: This contest uses any type of needle – sewing, crocheting, knitting, etc. BAKING CONTEST: The Juniors will use the same recipe as the adults. All entries must be clean and odor free. Create a video promoting your Grange. The video can be any length and of any theme. the video must be created by the Grange (or a member of the Grange) and not be produced by a non-Grange entity. Prizes: Best of Show submission will receive a certificate declaring their achievement, links on the Connecticut State Grange website and Social Media outlets, and a custom media blitz. Honorable Mentions will be awarded to all who submit entries. Prizes will be awarded at State Session in October. Submission Rules: Upload your completed video to YouTube, then send an e-mail to publicrealtions@ctstategrange.org containing the link to your YouTube page as your submission, as well as your Name, Grange Name and Number, Address, Phone Number and E-mail Address. We will send you a confirmation e-mail to verify your entry has been received. An integral part of Grange public relations is partnering with other local groups and organizations. This could be a co-hosted event, a co-sponsorship of a project or initiative, a project to benefit or honor a group/organization, and so much more! Write a description of how your Grange has integrated/utilized a Cooperative Partnership, and include a photo to accompany the description if appropriate. Prizes: Awards to be presented at the State Session in October. Submission Rules: Entries are to be a written description with no limit on length, and may include a photo or sample piece to accompany the description if appropriate. Submissions should be mailed to Public Relations Co-Director Robert Charbonneau, 102 Spring Street, Meriden, CT 06451, or sent via e-mail to publicrealtions@ctstategrange.org prior to the October 1 deadline. Submissions must contain the following information: Name, Grange Name and Number, Address, Phone Number and E-mail Address. Create a Buzz about your Grange, its projects, activities and events by managing a proper Facebook or Twitter Page. This contest is open to all Community Granges, Pomona Granges and Junior Granges. Contest Period: Pages must be active at any point within the one year period prior to the October 1 deadline. Submission Rules: Let us know when your Grange has set-up its Facebook and/or Twitter pages via e-mail to either publicrelations@ctstategrange.org or information@ctstategrange.org. Pages must be set-up according to the Social Media Guidelines specified by the Connecticut State Grange, and be in compliance with the Terms of Service of Facebook and/or Twitter. Prizes: Awards to be presented at State Session in October. Recognition Certificates will be awarded to all Granges who have Facebook and/or Twitter Pages. Each Grange is asked to nominate one of their members who they think qualify to be named the “Granger of the Year.” Applications will be sent to each Grange. Nominations to be sent to the Social Connection Committee Director by September 16. Program Theme: "The Junior Granger – The Individual"
The judging for the Big E contests will be held during “Let’s Celebrate” or CWA contests. • All work must be done by the Junior Member. • All entries must be labeled with the contestant’s name, Junior Grange and age as of January 1st that contest year - Ages 5-14. • All entries to be sent to State Session in October and must be in place in the Junior Grange/Hospitality room by 12:00 noon on Friday. • On most of the contests, there are no specific rules, use your imagination and have fun making them. • Creative Writing - on an 8.5” x 11” paper - 2017- Tell us why you joined the Grange and why you stay a member! 2018 - Tell us what is your favorite farm animal and why! 2017 - Decorate a gourd, using 1, 2 or 3 gourds - have fun - any style. 2018 - Decorate a flower pot - using paint, glue or any material - does not have to contain a live plant! A. Ages 5-9 - Draw a picture of Junior Grangers having fun. B. Ages 10-14- Create a Junior Grange Flyer - that explains what you do as a Junior Granger. • Photography - 5 categories as indicated below- each contestant can have one entry per category - all pictures must be 4x6 or 5x7 or 8x10 in size. They do not have to be matted or framed. 5a - Something celebrating America! If anyone is interested in participating in the National Contests for Public Speaking or Sign-A-Song, please contact a member of the committee by Oct. 1 so contests can be held at the State Level during State Session. With the implementation of the Jr. +1 Program, we can now ensure that all family members are eligible for Junior Grange activities. photos and newspaper articles. These will be judged at the State Session and must be in by 8 P.M. the first day of the Session. document it. All participants will be recognized. Send documentation of your activity to one of the State Youth Chairpersons. The luncheon at “Let’s Celebrate”/Grange Sunday will be in the charge of the Youth. the Youth to form a Drill Team to compete at the 2016 Northeast Youth Conference. If you wish to compete, please notify one of the State Youth Chairmen. Youth and Grange members are encouraged to attend Grange Sunday at the Big E/Eastern States Exposition in West Springfield Massachusetts and march in the parade in 2017 and 2018. A raffle will be held at the annual State Grange Session to help raise money for the Youth activities. Please support this raffle with small gifts.